#1. This week's number one is former international forward Gyno Pomare (203-86, college: San Diego, currently plays in Japan). He led Shimane Magic to a victory over the fifth-ranked Yamagata (1-3) 73-68 in the Japanese B2 League in Sunday night's game. Pomare was MVP of the game. He had a double-double by scoring 29 points and getting 13 rebounds. Pomare also added 3 assists and 2 blocks in 40 minutes on the court. Shimane Susanoo Magic (3-1) is placed second in West group. It was his team's third consecutive victory in a row. But this is still an early stage of the season and everything may happen. It's Pomare's first year with the team. He has individually a very good season with high stats. Pomare averages: 21.7ppg, 11.0rpg, 4.7apg, 2.0bpg, 2FGP: 59.6%(31-52) in three games he played so far. He is a naturalized American. Pomare played for the Panamanian senior national team two years ago. He used to play for Fieras de Cocle in Panamanian league. #2. Second place goes to an experienced international power forward Jamaal Levy (206-83, college: Wake Forest, currently plays in Argentina). Levy contributed to a 1-point Weber Bahia's victory against the second-ranked Penarol (3-2) 72-71 in the Argentinian La Liga last Friday. He recorded 7 points, 7 rebounds and 2 blocks. It was the game of the round between two top 3 ranked teams in Group D. Weber Bahia Blanca Basket (3-2) is placed first. It was his team's third consecutive victory in a row. There are only three games left until the end of the Regular Season. So now every game will be critical. It's Levy's first season with the team. Levy's overall stats this year are: 10.0ppg, 6.0rpg, 1.3apg, 2FGP: 61.1%(11-18). He is in the roster of the Panamanian senior national team. #3. The Panamanian player who performed third best last week abroad was an international forward Akil Mitchell (206-92, college: Virginia, currently plays in France). 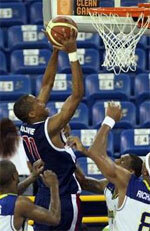 Mitchell could not help Boulazac Basket (3-1) to beat Chalon/Saor (3-1). He recorded 6 points and added 6 passes. Boulazac Basket was crushed 97-65 on the road by the higher-ranked Chalon/Saor (#3). But the season is still in it's first stage and everything can happen. Mitchell's overall stats this season are: 7.5ppg, 4.3rpg, 3.0apg, 1.8spg, 2FGP: 60.9%(14-23). He is a naturalized American. Mitchell is also a member of the Panamanian senior national team. Strangely he has never played in Panama. #4. Forward Tony Bishop (201-89, college: Texas St., currently plays in Romania) was not able to help Pitesti (0-1) in their last game. Despite Bishop's very good performance the seventh-placed Pitesti (0-1) lost 76-80 in Cluj Napoca to the leading Cluj Napoca in the Group A. He was the second best scorer with 16 points. Bishop also added 6 rebounds in 27 minutes. It was his first game for Pitesti this season. But there are still lots of games to play and it's a long way to go. Bishop is also Panamanian national team player. #5. Former international forward Pablo Rivas (198-94, college: N.C.Central, currently plays in Spain) was not able to secure a victory for Vic (0-2) in their last game on Saturday. Despite Rivas' good performance Vic (#12) was crushed 86-61 on the opponent's court by the much higher-ranked Albacete (#5) in the East group. He was the second best scorer with 12 points. Rivas also added 4 rebounds. Rivas' overall stats this season are: 9.5ppg and 3.0rpg. Worth to mention he played also at Eurobasket Summer League, which helped him get the job in pro basketball. He used to play for the Panamanian national team two years ago. #1. 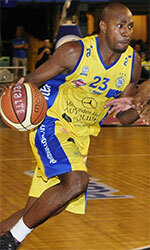 Doron Lamb (193-G-91, college: Kentucky, currently plays in Greece) could not help Lavrio (0-1) in their last game. Despite Lamb's very good performance Lavrio was edged 73-70 at home by the leading Aris. He was the second best scorer with 17 points in 20 minutes. It was his first game for Lavrio this season. But the season just started, so everything may happen. Lamb is a naturalized American. Strangely he has never played in Panama.